Sunrise's 2006 anime series Code Geass, in addition to being about a revolution, happens to be a prime representation of a real-world revolution in anime fandom — namely, a merge of the demographics for shōjo and mecha anime. It's a revolution that has been in progress at least since the '90s, when Mobile Suit Gundam Wing provided male fans with explosive robot battles and female fans with attractive, possibly homosexual robot pilots. Sunrise (the studio behind the Gundam franchise) has once again brought these two aesthetics together in a show that combines the studio's experience with giant robots and the character designs of shōjo superstars CLAMP (Cardcaptor Sakura, Chobits, Tsubasa). The revolution is under way, for better or for worse. Code Geass's melodramatic protagonist is Lelouch vi Britannia, a former prince of the Britannian Empire who escaped with his younger sister Nunnally after witnessing his mother's still-unsolved murder. The siblings now live a fake life as students in Area 11 (the conquered province formerly known as Japan) with childhood friend and Britannian soldier Suzaku Kururugi. But Area 11 has some problems of its own, in particular a populace forced into Britannian rule and brutally discriminated against, causing a variety of fringe groups to crop up and oppose the occupying force. After an unfortunate run-in with one of these terrorist groups, Lelouch meets a strange, green-haired girl named C.C. who grants him the power of "Geass" — the ability to command the actions of anyone via eye contact. With his newfound power, the prince rises up under the masked persona of "Zero" and leads the revolution of Japan, with the intention of uncovering the truth of his mother's death and making a new world for his sister. Indeed, that IS a mouthful! In reality, the story can be summed up in a simple comparison: Code Geass is what happens when you smash the original Mobile Suit Gundam together with Death Note. Zero is essentially Gundam's Char Aznable (a son of royalty who wears a mask to protect his identity) mixed with Death Note's Light Yagami (a teen gifted with a strange, highly manipulative power). All three shows also examine the idea of justice attained through a personal vendetta, and the consequences therein. With such a strange combination of influences, Code Geass is one of those modern anime that can appeal to a broad range of fans. Girls can ogle CLAMP's tall, thin pretty-boys, while fans of the intricate plotting of Death Note will find more than enough to love. 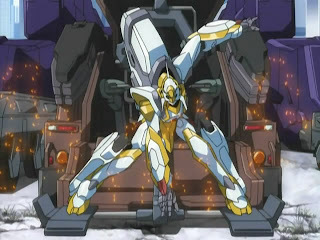 Unfortunately, mecha fans will find that, despite the number of robots in Code Geass, the show is not really about them. Kenji Teraoka's (Ghost in the Shell, Gundam 00) mechanical designs for the "Knightmare Frames" are certainly interesting, but their battles are often fought with overpowered one-hit-kill weapons or by no-name redshirts, so they lack the gravity and personal investment of most fights in the Gundam series. Don't get fooled by the presence of robots, though. Like an anime version of 24, Code Geass is all about the twists and turns. The entire fate of Japan can hinge on the momentary impulse of its viceroy or a carefully thought out move by Zero, and that inevitable modification of the status quo is what makes the show so compelling. I found myself feverishly watching episode after episode, just to see what Lelouch would do next to extricate himself from situations in which failure is nearly guaranteed. Naturally, the constant stream of twists can get tiring, and lend the series a sizable air of absurdity, but they sure do manage to keep it interesting episode after episode. Geass's art and animation are sharp, brightly colored, and stunningly clean, and the the robot fights — animated in CGI with cel-shading — are surprisingly well-integrated into the 2-D environments. Still, where the show really shines, technically, is in its depiction of CLAMP's character designs. Their distinctive aesthetic provides for some wacky hair colors and costumes, but Sunrise's more angular approach to the designs creates powerful depictions of emotion (usually anger) when the need arises. Lelouch and Suzaku in particular manage to look distinctive yet believable, a difficult feat in a show where two lead female characters have pink and green hair, respectively. Of course, don't miss out on Bang Zoom! 's (EDIT: Animaze's) fantastic dub, which utilizes the series' Western cultural aesthetic to implement English dialogue that fits its context much better than the Japanese. The dub also happens to be quite sonically accurate to the Japanese, thanks in no small part to an appropriately dramatic performance by Johnny Yong Bosch as Lelouch and an irritatingly high-pitched, yet accurate, depiction of Princess Euphemia from Michelle Ruff. When it comes down to it, the glue that holds the show together is the three-way relationship between Lelouch, Suzaku, and Nunnally. Lelouch's desire to create a new world for his sister puts him in direct conflict with his childhood friend (albeit anonymously), and since both of them care deeply for Nunnally, this secret war between friends creates some truly affective melodrama. 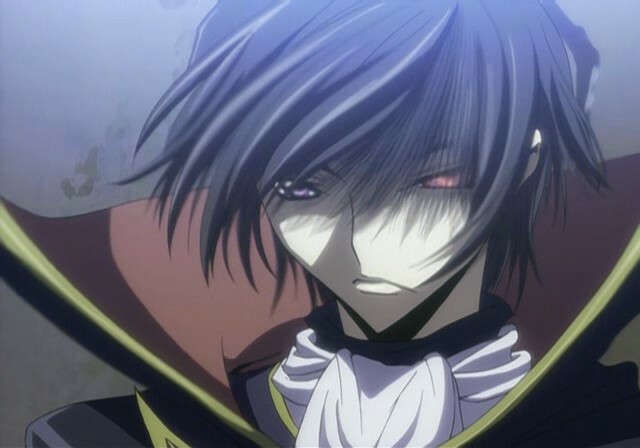 Lelouch is the main character, but his haughtiness and willingness to sacrifice almost anyone for his goals make him a villain, making Suzaku a hero and mucking up the show's moral thermometer. Such bold moves on the part of series writer Ichiro Okouchi (RahXephon, Stellvia, Turn A Gundam) are commendable despite many of Geass's other failings. Through all of the rebellions and back-door dealings, Code Geass is ultimately a show that see-saws between bursts of genuine quality and entire episodes of unbelievable silliness (i.e. every comedic episode that takes place at Lelouch's school). At its best, it is a dark moral and political drama that emphasizes the consequences of war and asks if and when good ends can justify evil means. At its worst, it is a dumb sitcom about a superhero and super-villain who happen to go to school together. 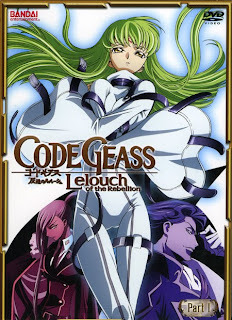 Available now on Bandai Entertainment's YouTube channel, the first season of Code Geass is an enjoyable ride overall, despite quite a few frustrating bumps along the way. Fans of fast-paced political dramas who enjoy some interesting moral questions in their anime should find much to love here, though the occasionally inane plot twists and weak mecha tie-in might set a few people off. This review is based on Bandai Entertainment's YouTube stream of the series.